I pick up the fresh poops that I see. I chunk up the big poops then mop the rest. I have paper on the floor in the Cockatiel room to catch poops from where they poop a lot. If on furniture, I let it dry and chunk it off then brush the dry stuff off. GDTB had a video taken by a diver of manatees eating. They are so big did you know they have little mouths. I was in a wildlife park when manatees were being fed. They threw ice berg lettuce in the water and the manatees pulled of one leaf at a time to eat. GDTB also had a video of rays playing with floating plastic balls. Any animal that is well fed can use it's time to play. They looked like they were playing soccer. They even tried to get them in their mouths but their mouths were too small. Charles heard a strange noise outside his trailer. He thought it was a turtle going along the edge of his underpinning. He went to look since we always put turtles on their way in the direction they were going. Instead he found a little armadillo. I did not get to see it. I have never seen a wild armadillo before. I wish I had seen it. Even when in Texas I did not see one alive. Yes, I do the same. On the floor, I scrape it off, spray it with a solution I make with warm water and a splash each of glass cleaner and dish detergent, let it sit for a couple of minutes and then wipe it off. The only problem I have is with the oak pressback chair backs because the birds love to perch on them and, when they poop, as it runs down, it goes into the carvings and the only way to get it off is to scrub it with a scrubby sponge -which ends up damaging the wood finish so we need to re-finish the chairs about twice a year. I have a little scraper I use just for scraping up dry poops. What is left easily mops off. I use an old tooth brush for little spaces on furniture. Fabric is also easy. Just scratch off and brush the rest off. I have started using old flat sheets in the room. I can pick up seed shells and poop all at the same time. I shake the seed shells out and crunch the big poops before putting in washer. They come out clean. It is much easier than using paper. I put unprinted news print for a base on their playgrounds and cages. it works pretty good unless they decide its fun to shred the paper....lol. But I just pick up the poops and scrap some. 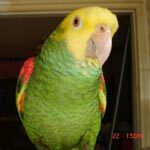 I find it easy to clean hard surfaces with an enzyme cleaner thats safe for parrots. Fabric is easy, I scrap it off and most comes of if it doesnt I use the enzyme cleaner. They all have favorite places to perch. I put an old towel on the furniture and a piece of paper under perches. Well, papers, towels or any other sort of covering doesn't work in my house because the birds are all over and they poop while they are flying. I do have the sofas and the tables covered but poop ends up everywhere [kitchen counters, coffee machine, ceiling fixture, lamps, chairs, etc]. Thank heaven that Myrtle does not poop when she flies. Rainbow leaves a trail but these days it is only to his step stool. He stays there all do and only comes out a few times to converse with me when I am in the kitchen. Myrtle has favorite places so I put a paper under her. A police officer found a slow mover in the fast left lane and had to pule him over. He was doing 1 mph when the speed limit was 35. You got it. It was a turtle. All traffic had to stop while the cop moved him. Yep, that's a 'slow mover' alright! Pajarita wrote: :lol: Yep, that's a 'slow mover' alright! I saw a turtle walking on his toes on a hot sidewalk. It was busy with humans walking in both directions. I guess he had done it many times. The humans just all walked around him like they were used to it too. I am amazed at how fast they can run when they want to. I watched one run away from me when he did not want help. I also saw him jump into a hole and saw daylight under him. All four feet were off the ground.